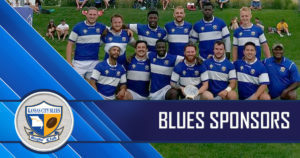 The Blues D2 side kicked off the action Saturday afternoon in Des Moines with a friendly against a very solid Des Moines RFC side. Locks Trevor Sousley and Tom Murphy did a great job leading the forwards throughout the day, keeping the boys playing within the offensive structure. 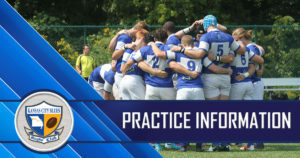 The first half saw a lot of good ball movement and organization on attack but several handling errors within the Blues' attacking third of the pitch resulted in missed try-scoring opportunities. However, stout defense across the board kept the Blues in the match. Center Conner Burke had a few gain-line breaks for good meters that the Blues were able to capitalize on. With the clock winding down, the Blues were able to tie things up at 22 apiece and were knocking at the door with seconds remaining when a knock on ended the match in a draw. Forward of the Match went to Austin Hamm who continues to excel at the flanker spot in his first year on a rugby pitch. Back of the Match went to Johnny Knutsen who broke a club record with 6 missed penalty kicks to touch. D2 will have a bye this weekend and will be back on April 20th for the Patrick Mercer Memorial Match against Pitt State Gorillas. The Blues D1 side had a good showing against a Metro side that used their match against the Blues to try out some of their club's up-and-coming talent. Talking off the ball was one of the key focuses going into the match as a way to really get into the offensive system quickly. Flanker Danny Apgar had a great game running in support, seemingly all over the pitch. Winger Dalton Humphrey continues to be a wrecking ball on the outside on both attack and defense. Flyhalf Blake Baty continues to do well controlling the flow of the game from the 10 spot and using his boot well when the situation arises. Ultimately, the boys played quite well but it really wasn't the Metro side that the Blues are accustomed to playing against. The final score was 48-5. 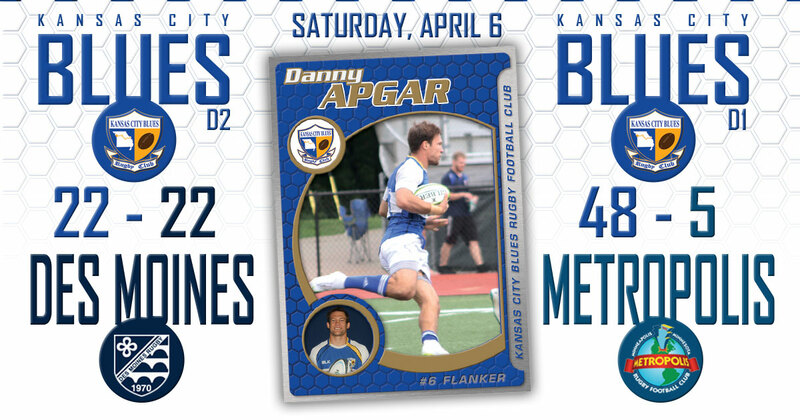 Apgar and Humphrey received well deserved Men of the Match honors for their efforts. Needless to say, once the final whistle blew, the Blues turned their attention to their upcoming match against City. 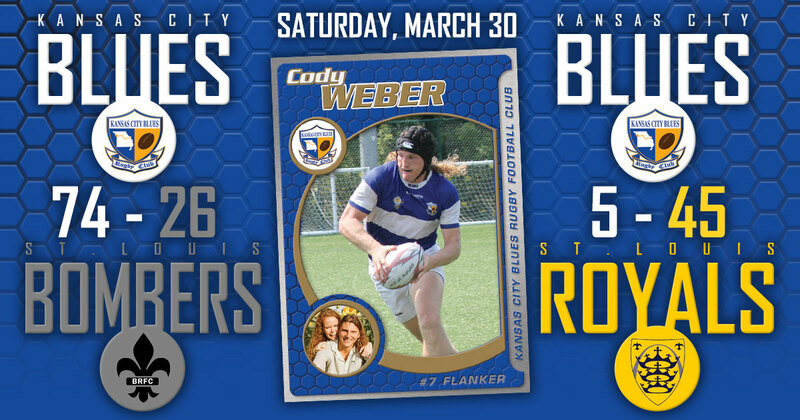 The match will kick off at 1:00 pm at Wyandotte County Park. It should be noted that the D1 side will be taking on City for the first time a quite a while so the boys would certainly appreciate your support in this happy reunion. 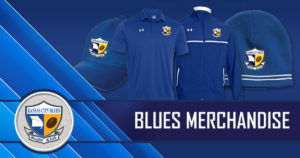 In addition to these match reports, the Blues would also like to extend a huge thanks to Des Moines RFC for hosting both D1&D2 sides and Metro,as well. 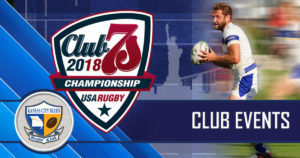 If you haven't been able to make the trip up to Des Moines complex before, it's the premier model for what a rugby club can accomplish in terms of professional setting. Their clubhouse, featuring two locker rooms, a recreational area, bar, dining area, and elevated deck over looking the pitches, is a testament to their alumni's commitment to growing the game for future generations. The walls of the clubhouse are adorned with old club pictures, posters and other memorabilia pointing to a long, storied past. When we as a club, and others, look toward our respective future development, Des Moines RFC certainly serves as a trailblazing model of what professionalism can look like from a player/alumni standpoint, but in terms of overall spectator-experience, as well.